With the release of Banner Saga 3 right around the corner, the team over at Stoic have recently released both Banner Saga 1 and Banner Saga 2 on the Nintendo Switch in preparation for the culmination of the trilogy. If you missed my review of BS1, I would highly encourage you to go check it out before reading this one. While I loved the first entry in this series, I was not sure what to expect from a sequel. Would it be more of the same? Would they opt for an entirely different direction? The answer is actually somewhere in the middle. In Banner Saga 2, the creators manage to keep all the aspects that made me fall in love with the first game while tweaking enough elements to make this title feel even more polished, challenging, and beautiful. 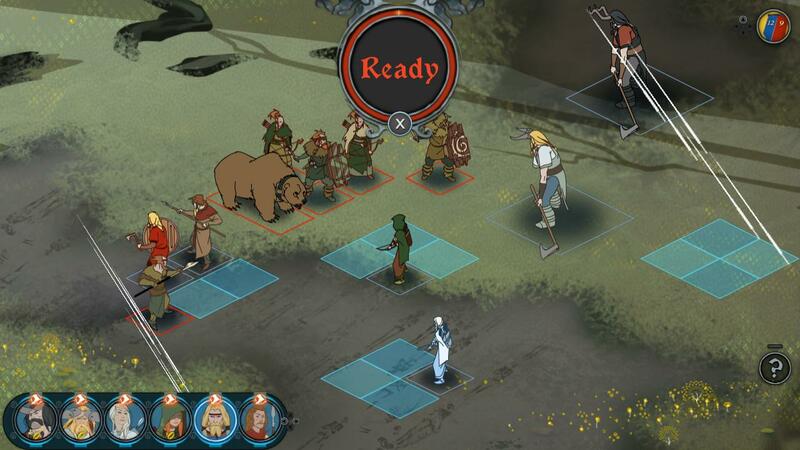 Banner Saga 2’s story picks up shortly after the conclusion of the first game. This is not a game that jumps two or three years into the future to focus on different characters or perspectives. It has a direct narrative continuation. While managing to become grander and at times darker in scale, it never loses the immensely personal focus of BS1. That laserpoint focus was one of the major successes of the initial entry, and so to see it return was a relief. Many times, sequels seem to believe they must have bigger maps and more party members and bigger explosions for the sake of being “better” than the original. Spoiler alert, those things rarely make a game better, and instead distract the developer from actually focusing on going deeper into the fascinating stories and characters that made the first game good to begin with. Banner Saga 2 balances the newness of a sequel without losing the heart of what made the original amazing. One of those areas is with characters. In this story, characters are always at the forefront of every turn in the road, regardless of being POV characters or not. Speaking of POV characters, they introduce a new one here that carries you through half of the story. BS2 cleans up the perspectives this time around by making it clear and consistent from the beginning who you will control for the entirety. 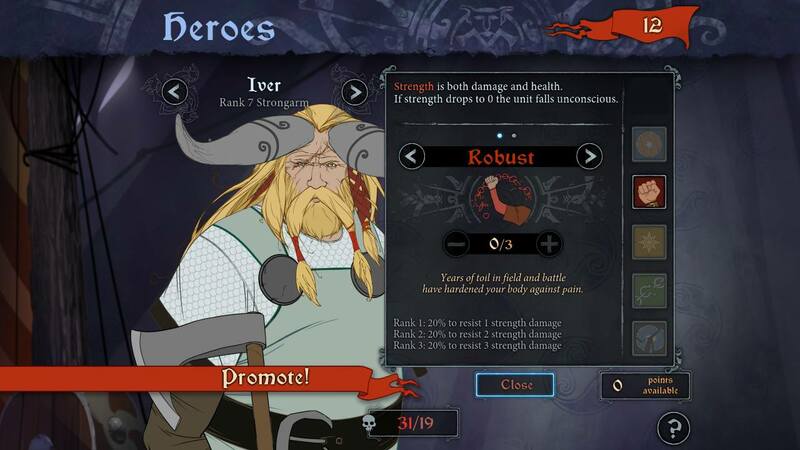 In Banner Saga 1, you control Ubin for the first chapter but then never play as him again. You then play Rook for the second chapter, Hakon for the third chapter, and then Rook for the rest of the five chapters. 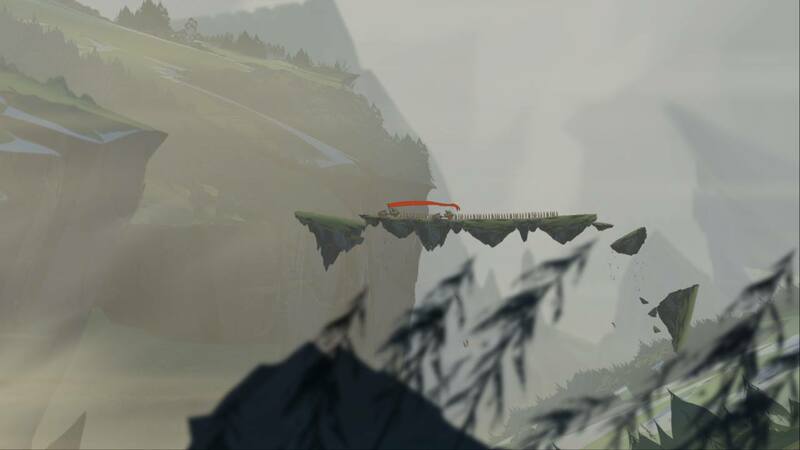 While that setup didn’t keep me from growing attached to the characters or the story, the way perspective works in Banner Saga 2 is superior. From the outset, the story alternates perspective by chapter, providing a structural expectation and sticking to it. Each time a chapter ends, I know exactly where the story will jump next. It makes the whole experience feel clean and concise. The choices are just as difficult, if not more so here than before. And yes, the character deaths return and bring a weighted punch. There was a single moment toward the middle of the plot that made me sick to my stomach for a moment because of a consequence for one of my decisions. Did I think about loading an earlier save? Yes. Did I? No. For the purity of my first playthrough, I lived with the tragedy of my selection, and it still haunts me as I write this. That’s the type of impact this story makes – it’s lasting. 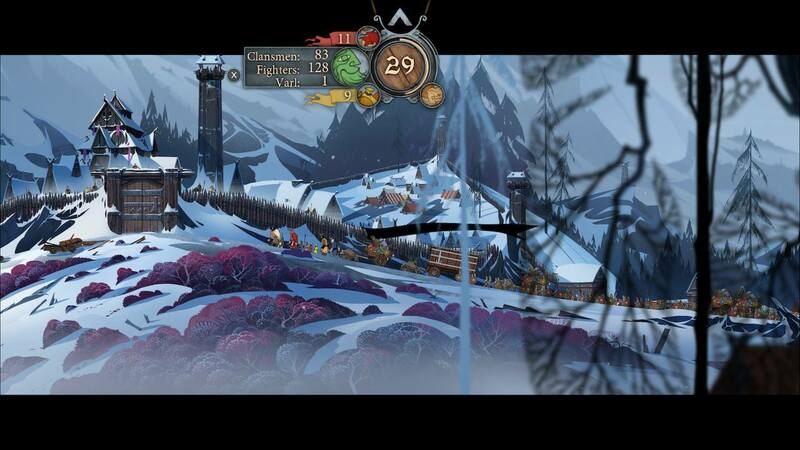 The look of the game itself has not changed from Banner Saga 1, and to be honest, that’s a good thing. Its gorgeous, hand drawn aesthetic did not need overhauling, looking like a timeless animated film. What did change, however, were the variety in locations and environmental themes throughout the world. As the story moves toward a greater magical emphasis, the look and feel of the game reflects that, allowing for both beautiful and captivating presentation. The actual animation of the environments felt more visceral in Banner Saga 2, contributing to the feeling of more fleshed-out look. For example, early in the game, your caravan must cross a vast split in the earth solely through the use of magic. While watching this scene unfold, I nearly forgot I was playing a game as I was too stressed to even think about it. Somehow, however, it manages to balance that stress with true fascination by the mastery of the art and animation. That particular scene still gives me chills when I think about it. One of the most impressive aspects to this game is that there are two major points that easily make you want to play it twice. The first is a choice right from the title screen. The first game ends with a player choice that forces you to choose to play either as one character or the other. The developer took the time to create fully fleshed scenarios for either character to be present, an impressive feat. For this type of gameplay (choices spanning multiple games, storylines and dialogue written contextually based upon what character you choose to play at the beginning) to be coming from a small independent team instead of huge studio as we would expect truly makes my heart glad. The second point in the game that makes me want to play it again is actually the situation I referred to earlier. Remember the trauma I went through? Had I made a different decision there, my game experience would have changed (I watched someone else’s playthrough after my own mistakes, so I’m speaking from experience). Once again, I cannot speak highly enough of the care and precision with which a story and world like this is presented, especially coming from a team of its size. If you did not play the first game (or if you didn’t finish it), Banner Saga 2 does give you a jumping on point with its title screen. 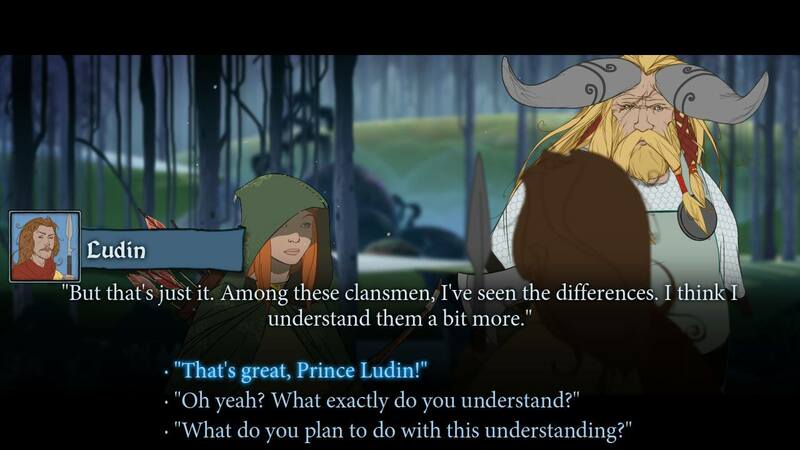 (To be clear, I would highly suggest playing Banner Saga 1 before this game). It does feature an import save option that allows players to bring over their save data from the first game, but if you don’t have it, the game will start you with a generic world state. It won’t be customized to your horrible decisions, but it at least allows players to have an ability to play it first if they so choose. After using some choice-based systems that allow you to make the game’s major decisions outside the game and import them later, I wish there was something like that for this series. It would allow you to jump into the Switch version of Banner Saga 2 with all of your personal choices even if you played the first on PC. Regardless, their current system gets you in the game quickly and easily. If you remember me saying I wish there had been more VO work in Banner Saga 1, that sentiment still stands here. It’s hard for me to tell if there is actually more or less, but regardless, I wish much more of this game were voiced. And I only say that because of the quality of the VO that’s in the game already. At certain points, characters will speak over important cutscenes. It adds yet another level of flavor to the feeling of the atmosphere and the lore. The variety I mentioned earlier does not only pertain to the environment and art: the character models and types of characters you run into in Banner Saga 2 show more diversity than the first game. 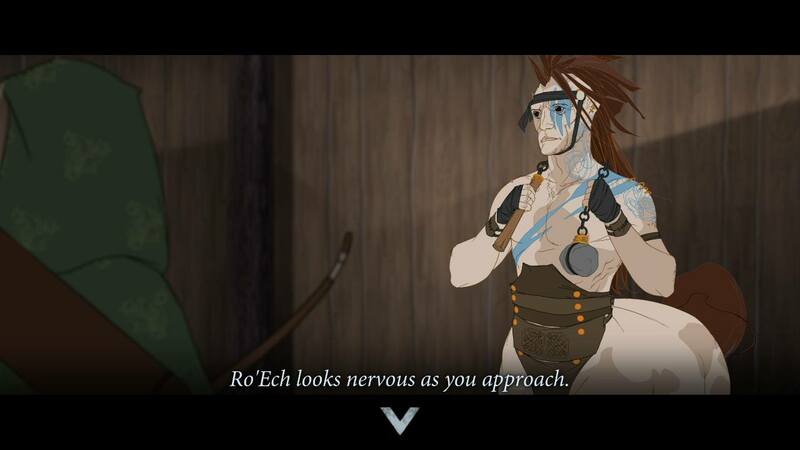 The newly introduced main characters present here look and feel different (both in terms of varl and human) where the characters in the first game (particularly the varl) felt a bit samey. 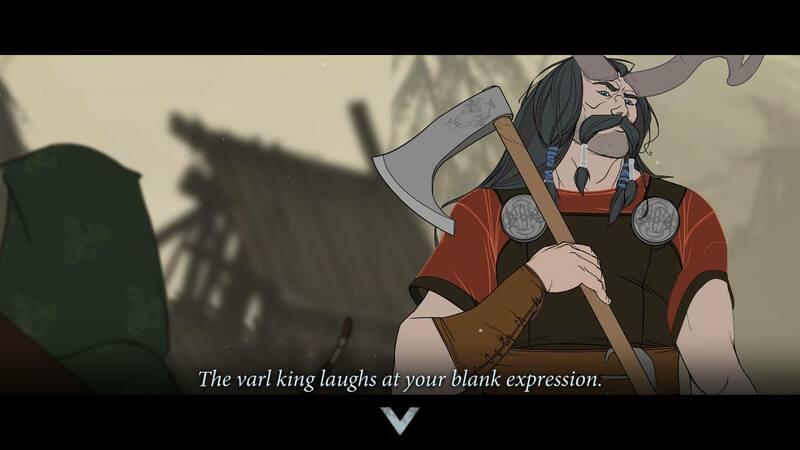 For example, Bolverk, while appearing in Banner Saga 1, plays a vital role here and brings a much different personality, dialogue choices, and appearance when compared to the other varl. Diversity also popped up in the types of enemies you face. Gone are the days where most of your enemies are more than likely dredge. Now, you’ll face more dredge, humans, centaurs, and new KINDS of dredge. Notice how I mention centaurs; you can’t get more varied than introducing a new race of creatures. These new additions become part of the plot, part of your party, and part of your lives. 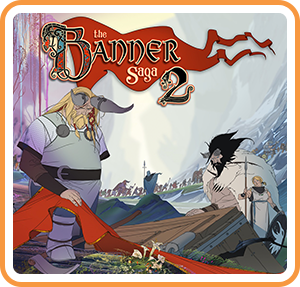 When I first saw the art for Banner Saga 2 and saw that the story was a continuation of the first game, I immediately assumed this entry would serve more like DLC than a sequel (an addition to the original content while at the same time being a carbon copy of its elements). I could not have been more wrong. While the changes in the art are subtle and discovered through careful study, the changes in combat are quite apparent very early on. The mechanics from BS1 that made battles fun, challenging, and exciting are all there: the ever-present debate whether to attack armor or strength, the management of finite willpower, and the sweet temptation to load your party with varl. It’s all there. But enemy reinforcements have become a prevalent feature here. Whereas in the first game, certain dredge units could sacrifice a few of their turns to summon comrades, the reinforcements in BS2 can just show up when they want to. This element brings another level of intensity as these units come onto the field fresh when you could have been scraping through an encounter. Not only do enemy units come to the battlefield but “environmental” units, in the form of smaller creatures, also show up to really wreck your strategies. They don’t count toward the enemy tally as you don’t have to kill them in order to end the battle, but they get turns to damage you and can even become invisible to prevent from you returning the favor. These annoying creatures add yet something else to keep track of on the field, furthering the fact that the combat in BS2 is definitely not a simple copy and paste from BS1. Renown acquisition is back, and your quest to not run out before you feed your caravan, level your party member, and provide them with much-needed items still hangs over your head. Leveling up your party, however, feels a little bit different in BS2. The level cap in BS1 was 5, and this game allows you to go beyond that with some interesting results. At level 6, you get to choose a second special ability for your unit, fleshing out their playstyle and making them much more of a best on the battlefield. Maybe you loved one of the abilities from a different character, but he was severely underleveled? No problem, now you can add that ability to your favorite unit as long as they share the same class. Since you’re making your units stronger than they were in BS1, whole new options open up to you that while they existed in the first game definitely shine in this one. Once you max out a character’s stat (for this example, we’ll use willpower), you can click on the stat’s icon to find talents you could invest points in to give your character specific willpower-related aspects. Not only does this make your character more useful, but it also allows you to change the taste of one character compared to another, even of the same weapon-type. You could take two archers down two separate talent trees in willpower and wind up with characters that feel and react differently on the battlefield. As I said before, this talent system actually existed in BS1, but I found it somewhat difficult to max out certain stats because I wanted to level each stat evenly. However, getting past level 5, it’s much easier to find that stat ceiling for your characters and therefore discover the wonderful world of talents. It does add yet another level of management where you then wonder if you should invest points in an actual stat such as strength of armor or if you should invest the points into a talent inside a maxed stat. One area I felt lacked a bit in BS1 was the training tent. It would allow you to test strategies by facing no-stake battles that resulted in no deaths and no renown (kills did count toward promotion, which was nice). In my BS1 review, I also stated a wish that there were other ways to obtain renown as the scripted battles made it a scarce commodity. Thankfully, BS2 addresses both of these points by tweaking the way the training tents work. First of all, you can now train clansmen into fighters, giving you something else to manage. But the second addition to the training tent comes in the form of challenge events, battle scenarios with very specific objectives. While I wasn’t a huge fan at just how particular some of the objectives were, I do appreciate the fact that you obtain renown upon completion of all objectives. The renown you gain here could be the difference in being able to promote one of your units or not and was a welcome bonus to the training tent. One of the best things I could say about a game is that I would play it again. For Banner Saga 2, upon completing it, I immediately started the first game from the beginning just so I could experience Banner Saga 2 again in its entirety. For me, Banner Saga 2 somehow takes one of my favorite game I’ve played in recent memory and improves upon it. It adds so many small elements of management that the culmination makes it feel vastly different from the first game. The battles feel fiercer, the choices are just as agonizing, and the characters feel more complex than ever. While there are some additions that give me some of what I want, like the Training Scenarios, their implementation didn’t quite hit the mark for me. After the first handful of those missions, the mission objects became so hard that it made me put them away and ignore them the rest of the game, making me miss out on valuable renown. I can’t complain about this too much, however, as I know much of it lies on me not being good enough to complete them. Even with not fully enjoying this feature, BS2 gives the player so many other things to think about, enjoy, and happily dread throughout their playthrough. Much like the first, Banner Saga 2 gives me a game that I have thought about after finishing almost as much as I actually played it. Yes, I want to experience it again (will indeed experience it again), and like I said, that’s one of the biggest compliments I can give to a game in this time of my life.